So the guesting gigs keep on keepin' on at Nathaniel Rogers's The Film Experience, with the regular column and other goodies as well. Continuing with my weekly series Cinema de Gym, I offered a post on "Outbreak," the 1995 sickness flick that Hollywoodized Ebola. I explained my fear of global pandemics as the ultimate film villain (which, as it happens, is perfectly timed with the "Contagion" trailer release). Check out the post HERE. 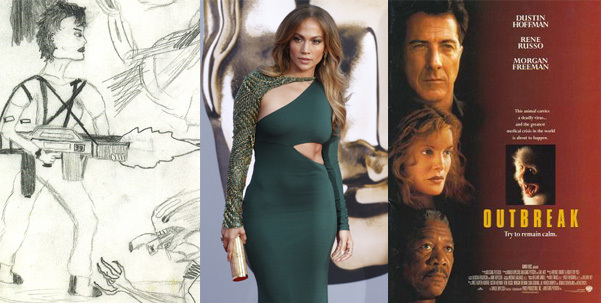 Pick your poison: Ripley, J.Lo, "Outbreak"
In addition, Nathaniel and I chatted with fellow film and fashion junkie Jose Solis Mayen about the latest in red carpet loveliness (or not-so-loveliness, if your name starts with J. and ends with Lo). Done very on-the-fly, in chat form, these discussions always start to go to my head, making me giddy and giggly like a fool. This one made me lose my motor functions, apparently. READ IT! Finally I offered a very personal, very offbeat essay on "Aliens" to coincide with Nathaniel's celebration of the action masterpiece's 25th anniversary. It was a super fun piece to whip up, and I was pleased it got a sweet response (kisses and facehuggers to all you lovely TFE readers who had nice things to say about it). Read it for yourself, RIGHT HERE.